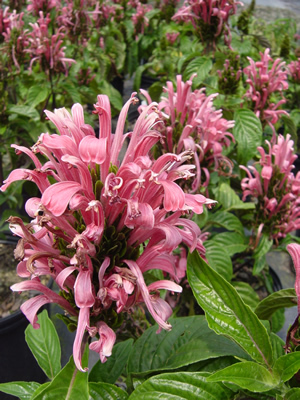 usticia x ‘Thelma’s Pink’ is a subtropical evergreen plant with outstanding 2″ long pink tubular blooms. Flowers are held in a dense pine-cone like cluster, stems are 4-5″ tall holding blooms above the dark green foliage. Thelma’s Pink Brazilian Plume will bloom from midsummer through fall. The growth habit is erect and sparsely branched, the leaves can grow up to 10″ long. Justicia x ‘Thelma’s Pink’ can reach 4′ tall with a 3′ spread.